Today marks a major milestone in my SWTOR playing: I. Have. My. Purple. Lightsaber!!!!!!!!!!!!!!!!!! Yes, the first thing I did tonight once I made it home from work was head to the Galactic fleet to track down the new vendor who was selling the lightsaber crystals. 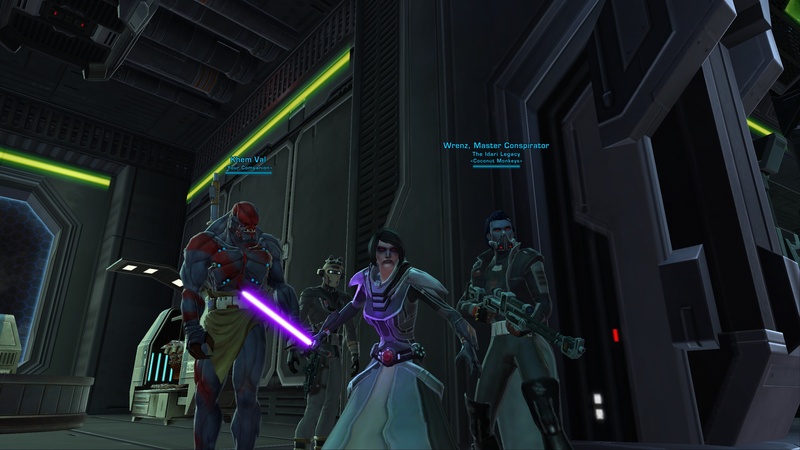 And for the low low price of only 125,000 credits, the awesome purple crystal was all mine. So, where do you buy the new crystals, you may ask? On the Imperial fleet, Geologist Pajro in the middle of the outer ring of the Galactic Trade sector sells the purple crystals, along with red, green, yellow/black and white crystals, and the pattern for the magenta crystal. On the Republic Fleet, it’s Geologist Breshin in that same spot. I would like to give a big THANK YOU to the developers who heard loud and clear that there was a major desire for the purple crystals and made it happen for us. The devotees of the purple lightning and the purple crystals are much appreciative.